we won!!! The German trade press has awarded AIT the title of best trade magazine 2018! On the next two pages we will tell you why we have been honoured for the 4th time and how we celebrated this occasion. Inspired by this news, we dedicated ourselves to the topic of our current issue, Bar Hotel Restaurant, to work through our impressions gathered at the Salone del Mobile in Milan (from page 32; on the left: “The Diner” installation by David Rockwell at Ventura Centrale). We not only took a closer look at the gastronomic projects, but also slept, bathed, ate there and – in the end – wrote about it. 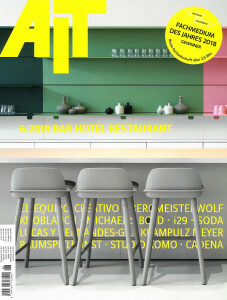 We visited St. Moritz, Büsum, Imst, Hamburg, Vienna, Offenburg, Stuttgart, Pontresina (picture below), and Amsterdam and have brought back first-hand information and impressions, which we have turned into an exciting mix of reports on remarkable bars, hotels, and restaurants (from page 84) for this issue. The first sunny days had an inspiring effect on the composition of the large special outdoor section (page 74). For the start of the summer season, we are presenting deckchairs, chairs, umbrellas, and luminaires for outdoors use in restaurants and cafés. Three very different representatives of our interior design/architectural profession are the focus of our series Mrs. Architect, Change of Perspective, and Apprenticeship at… Margarete Schütte-Lihotzky was much more than “just” the inventor of Frankfurt cuisine and has achieved astonishing things in her 103 years of life (page 52). Few interior designers are known from radio and television – but Eva Brenner can claim exactly that. Since studying interior design, she has been presenting television programmes and has told us about her work in front of the camera (page 56). Marie Menninger, an architecture student, is still at the very beginning of her career. One of her stations is an internship abroad at Kubota Bachmann in Paris (from page 60). Towards our editorial deadline, we had a very special experience in the “Ellington” in Berlin. On May 16th, we received the trophy for the best trade magazine 2018!